You are healed when enemy attacks. Deals area damage when effect ends. Eclipse: Envelop enemy in a lightless sphere, causing [6152 / 6218 / 6287 / 6355] Magic Damage each time they use a direct damage attack. Total Dark: Envelop enemy in a lightless sphere, causing [6357 / 6426 / 6496 / 6566] Magic Damage and healing you for [6357 / 6426 / 6496 / 6566] each time they use a direct damage attack. 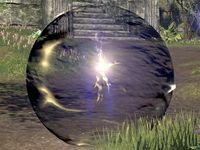 Unstable Core: Envelop enemy in a lightless sphere, causing [6354 / 6423 / 6493 / 6563] Magic Damage each time they use a direct damage attack. Place volatile magnetic energy on an enemy which explodes after 4 seconds, dealing [5534 / 5595 / 5656 / 5716] Magic Damage to them and nearby enemies. Eclipse reflects the target's spells back to them and explodes at the end of the effect, dealing Magic Damage to the target and other nearby enemies. The Unstable Core morph removes the reflect effect but increases the ending blast damage instead. Or you can use Total Dark, which heals you for each reflected spell. This spell is mostly useful against spellcasters (unless you use Unstable Core). The explosion at the end is still useful against all targets, but only if the target survives long enough for the blast to occur. One subtle use for this spell is that it can be used against non-hostile targets such as bugs and rats, etc. This turns them into tiny little bombs which will still deal area damage to your enemies. With Unstable Core, you can set up a couple of them without actually alerting the enemy to your presence, so they'll go off during the fight. So look around for those little critters if they happen to be nearby, because this spell can actually make them useful. Before Update 13, only the Unstable Core morph could be placed on an unlimited amount of enemies. Total Dark: The tooltip now lists the correct duration for this ability. Fixed an issue where the caster of this ability was being charged magicka every time a spell was reflected. Twin Slashes and Searing Strike. Added a new graphical effect to this ability when projectiles are reflected. Total Dark: This ability now heals the caster for each projectile reflected by the ability. Unstable Core: This ability will now explode if the affected target uses CC Break or Cleanse to remove it. Also fixed an issue where this ability was able to deal full damage to more than 6 targets. This ability's area-of-effect damage now correctly prioritizes targets. Fixed an issue where this ability would trigger your global cooldowns every time it reflected another ability. Unstable Core: Increased the area damage when the effect ends by 50% and can be placed on an unlimited amount of targets, but it no longer reflects single target spells back to the enemy. Fixed an issue where this ability and the Total Dark morph were not dealing their area-of-effect explosion damage. This ability and the Total Dark morph can now be placed on an unlimited amount of targets. This ability and its morphs will now deal their Area of Effect damage even if the target dies. Power of the Light (Backlash morph): Fixed an issue where this morph's damage was being mitigated on the target's Spell Resistance instead of their Physical Resistance. Developer Comment: The damage of Radiant Destruction was so high that players were able to cast this on targets with high health values and still deal effective damage. This change makes it more important to use the ability at the correct time. In PvP, other players now have more time to react, and in PvE the rotation requires using multiple abilities for a longer period of time. This ability and its morphs now last for 3.5 seconds, down from 6 seconds, but can no longer be removed with Break Free. After the effect ends, enemies will gain CC-immunity. Reduced the cost of this ability and its morphs by approximately 20%. Eclipse: This ability and its morphs now returns damage whenever the affected enemy casts a direct damage attack. It still grants crowd control immunity when the effect ends and can now be removed by Break Free. Eclipse can also now be placed on an unlimited amount of enemies as a baseline effect. Total Dark: This morph will heal you when the target casts a direct damage attack. Unstable Core: This morph adds area of effect damage when the effect ends. Developer Notes: Similar to Petrify, we wanted to change this disorient into a stun while retaining its current functionality to make useful in more situations. Casting Eclipse when you have low health means the enemy may be able to ignore it and still kill your character. However, if you are able to stay alive, it can shift the tide of battle in your favor against an aggressive opponent.